Various classes of engines were used to haul the "Atlantic Coast Express" including the ‘Merchant Navy’ and slightly smaller engines of the "West Country" class at 67ft 4in in length and 23 tons lighter than the ‘MNs’ at a total weight of 129 tons. 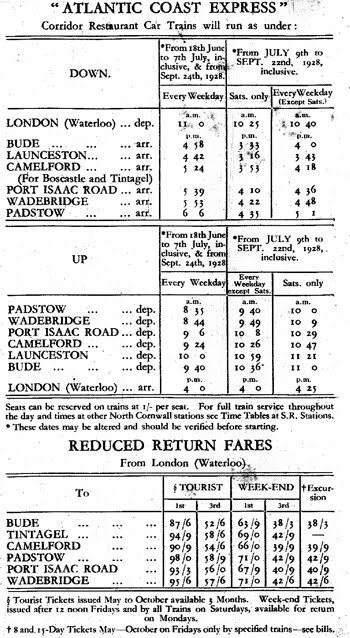 The last “Atlantic Coast Express” left Padstow at 11am on the 5th September 1964, this famous train that had for so long linked London with the invigorating holiday environment of North Cornwall’s Atlantic Coast ceased to exist. Lines south of Okehampton were closed some two years later and the era of steam and rail travel in much of rural Devon and Cornwall came to an end.